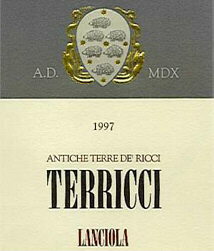 At FanciFull we just picked up an unbeatable deal on one of our most popular wines, the 1999 Terricci! Our supplier needed to make room for more wines and made us an offer we couldn't refuse. We bought every case they had and are passing the savings on to you. We're able to offer this delicious wine at almost half off its original $60 price. But make sure you hurry, because we're sure to run out before the holiday season is over. This Super Tuscan is a blend of Sangiovese, Cabernet Sauvignon, and Cabernet Franc. It has a sumptuous structure, velvet texture, great body and balance. Supple on the tongue, with a nose of black current and raspberry this smooth full wine has a long finish and will go with a variety of foods. It is aged 18 months in barriques and 12 months in the bottle. Its incredible balance is a testament to the winemakers art. We have enjoyed it with aged Peccorino, grilled steaks, pasta Bolognese - the possibilities are endless. Wine Advocate gave it a 92 pt rating.